The beautiful Woodland Scenics J. Frank’s IGA Grocery Store came with a great printed shadow-box interior, but you couldn’t see it (see my review and photos of the building). Here is a model that calls out for interior lighting. Since the interior details were already there, it makes for an extremely simple project – just add lights. As you can see from the result, anyone with this building will want to add interior lighting. 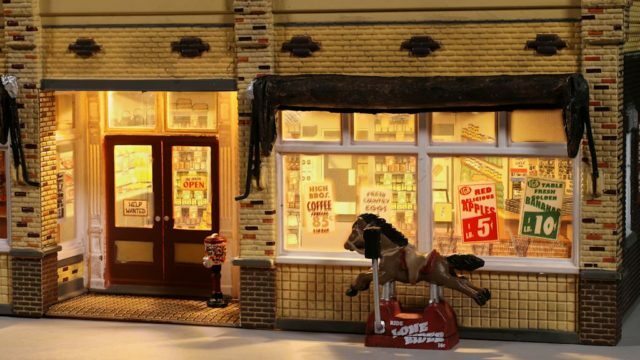 Since it came with a very nice printed interior, the Woodland Scenics Frank’s IGA Grocery is the perfect ready-to-go candidate for quick and easy LED interior lighting. You’ll want to use LEDs as they don’t generate any heat, and last up to 20,000 hours (no future bulb replacements). The simplest way is to use sign/lightbox LED modules. 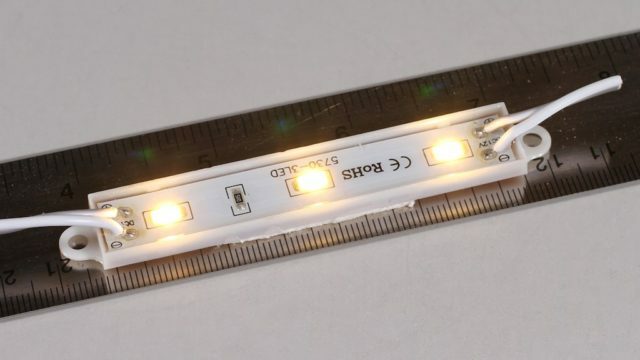 These have three LEDs mounted in a plastic frame ready to install with peel-and-stick tape on the back. They use a 12 volt DC power supply, and have wires pre-installed. Even better, you can get twenty of them for only $8. Their 3.1″ long by 0.6″ wide by 0.2″ deep size is perfect for small structures like this one, and you can use multiple modules for larger buildings, as the modules are shipped wired together. Cut off one module for this building. Solder on wires as long as you need to reach your 12 volt DC power supply. The polarity is marked on the module (little “+” and “-“). If you have the polarity backwards the module will not light. Move the printed interior of the building back a little to get to the roof inside. Peel off the protective film from the self-stick tape on the back of the module. Stick it on the inside roof of the building next to the front windows so it lights up the printed interior. Move the printed interior back in place. Set on your layout, connect power, and smile! The LED sign/lightbox modules as they arrive from Amazon. Note I cut one off already. The modules arrive as a set of twenty, all wired together ready to use. You can cut individual modules off, or use as many wired together as you need (for larger buildings). Any way you use them, they need a single 12 volt DC power connection (only DC, not AC – and make sure it is 12 VDC or less). 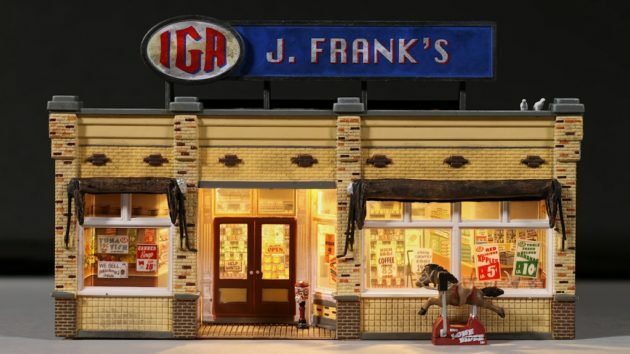 The module I used in my J. Frank’s IGA Grocery is the warm white 3000K color temperature version. This gives the warm glow of incandescent lights and fits my 50s era layout. If you want the bright white look of modern fluorescent lighting, order daylight 6000K color temperature modules instead. Just came across this article. Very interesting. I’m thinking about trying them. 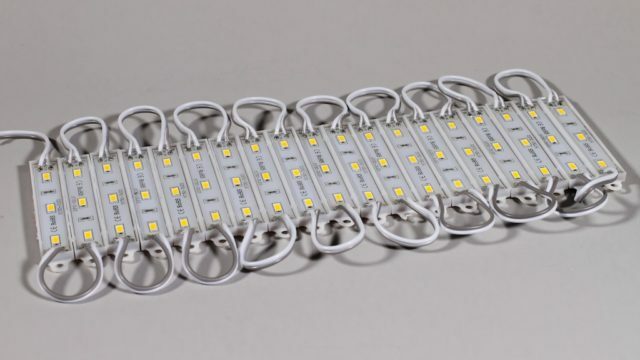 If they are too bright for a small structure could I use a small resistor to dim it slightly? The market I put them in for this example is a fairly small structure and I’m only lighting the front half of the interior (because of the printed interior divider). As you can see, this provided a medium to somewhat bright amount of light. Adding a resistor in series with the unit will provide dimming, but you will have to experiment with the value for that resistor. Too high of a resistance will cause it not to light at all. I would recommend that the added resistor be installed below the layout and not in the building, as it will likely get slightly warm (not hot).